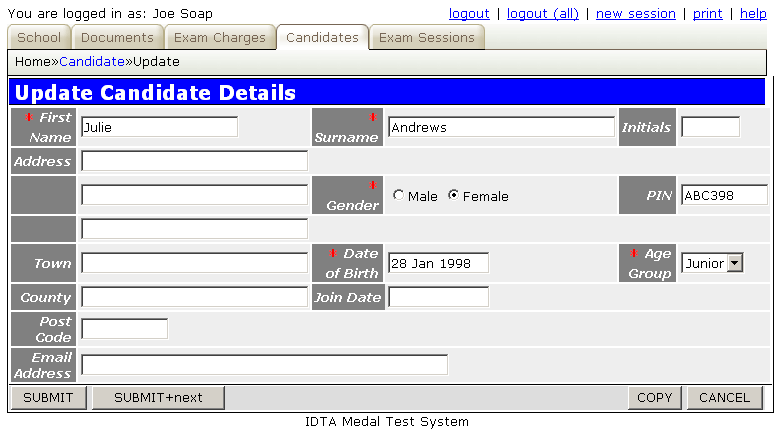 The Candidates Page will display a list of all candidates entered into the system. By default the candidates are listed in Last Name order. New Will allow entry of a new candidate (see below for details). Search Displays the Search screen within which the user can enter parameters to find one or more candidates (e.g. search for all Juniors). The main screen will then be filtered to show only those candidates meeting the search criteria. The buttons below require one or more candidates to be selected first. If a candidate is not selected when using these buttons the error message "Primary key (candidate_id) is not complete - check selection" will be displayed. Show Displays the information about the candidate(s) selected, without allowing them to be modified. 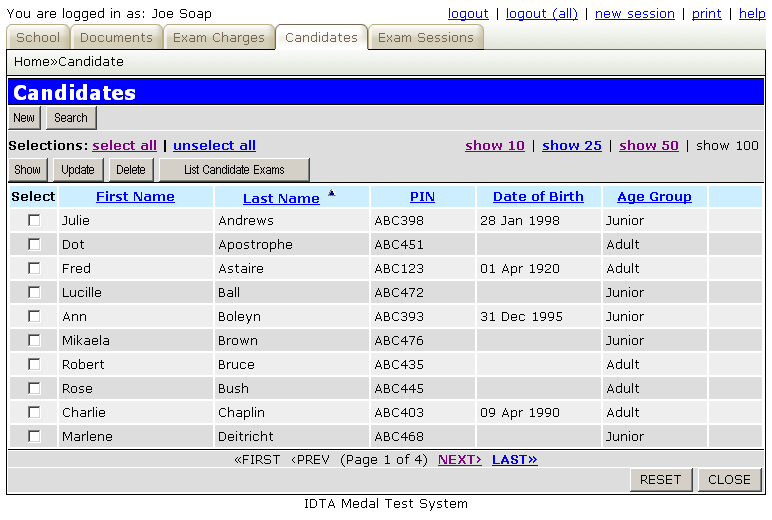 Update Displays the information about the candidate(s) selected and allows the information to be updated. Delete Displays the information about the candidate(s) selected, one at a time. Confirmation is requested before deleting the candidate details. A candidate may only be deleted if there are no corresponding examination entries for the candidate, otherwise the error message "Cannot delete - record still linked to EXAM table" will be displayed. List Candidate Exams This option will display all the examination history for the selected candidate(s), one at a time, including results if these have been entered. RESET This will reset any search criteria that has been entered, or change in sort order, and redisplay the full candidate list in Last Name order. CLOSE This will close the screen and return to the Home Page. First Name The candidate's first name. Surname The candidate's last name. PIN The PIN code is required for IDTA examination documentation. If it is left blank the value N/A will be displayed and the candidate's Date of Birth will be used on the examination documentation instead. You may return to this screen and enter the PIN once assigned by the IDTA. Date of Birth The Date of Birth will be used on examination documentation if the candidates PIN code is not known (value N/A). The field may be left blank. Age Group The Age Group is no longer required on examination documentation, however the Age Group selected will determine the exam charges to be used for the candidate via the Exam Charges Section. Other The remaining fields are all optional. They are currently not used by any parts of the system.